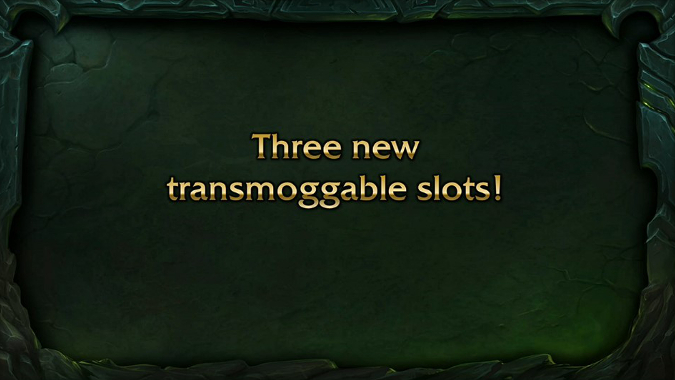 At the Legion systems panel we were given a glimpse to the brand new transmogrification system and it is a thing of beauty. 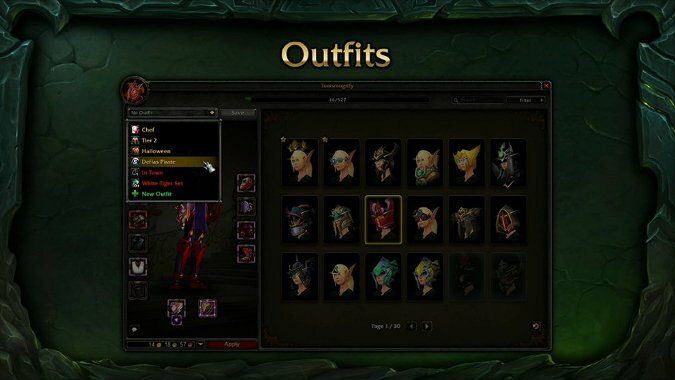 Coming in Legion is the Wardrobe, an all new, account wide transmog system that allows you to unlock the appearance of an item and then keep or discard it as you choose. 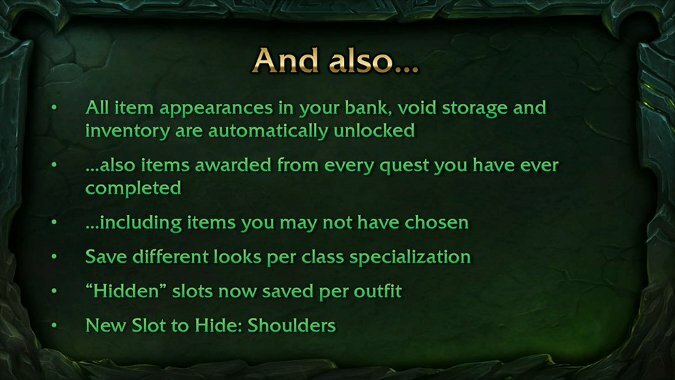 Once you have a piece of gear, you have that as part of the transmog system forever — if you’ve been keeping that green Training Sword of the Monkey in the bank forever, you can now delete it. There are a ton of new options to the new system. In addition to being account wide, you can now save entire Outfits, even share them with other players (this will generate a shopping list so they can look for those items if they don’t have them). The Outfits will even be able to be locked to a specialization, so you can make a specific Shadow Priest or Ret Paladin transmog set. The Wardrobe will let you see what each item will look like on your character before you even use it. Items you’ve deleted in the past? You’ll get their appearances unlocked. Quest items you didn’t even choose? You’ll get them in addition to the items that you did. We have three new transmog slots, tabards, weapon enchants and shirts. You’ll also be able to hide your shoulders in addition to helmets and cloaks, which I think is an amazing feature. So looking over all of it — this fully account wide, unlockable system that doesn’t force you to keep all of the gear, which will not penalize you for choices you made years ago, which will give you bag space back and let you make choices above and beyond anything you can do in WoW‘s current transmog system — I think we basically can say this is transmog Christmas. Amazing.